"If Tyranny and Oppression come to this land, it will be in the guise of fighting a foreign enemy." - James Madison over 200 years ago. Look at the above chart. 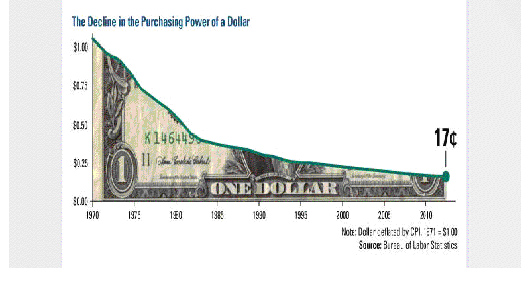 This is what has happened to the dollar in forty three years. It is now worth a lousy 17 cents. It just gets worse from here with QE to Infinity. Bernanke brags about Quantative Easing to Infinity. There is no "tapering". There are only two things that will save you- gold and silver. Silver is four times better than gold, and will return to the traditional, historical 15 to 1 ratio. Maybe even 10 to 1. It is now an insane 65 to 1. Silver supply is the lowest vs demand in 500 years. This is a contrarians dream! No currency on earth has any value now. For the first time in the history of the world all currencies are worthless fiat scams. Every country is now in a race to devalue their currency. You have no choice but to put your net worth into real silver bullion. 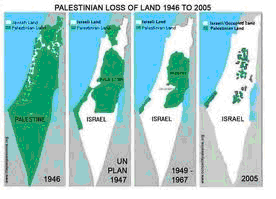 The above chart shows what the Jews have done to the Palestinians since World War 2. They have taken 90% of their land and will take the last 10%. Their goal is to drive every single Palestinian out of their homeland. 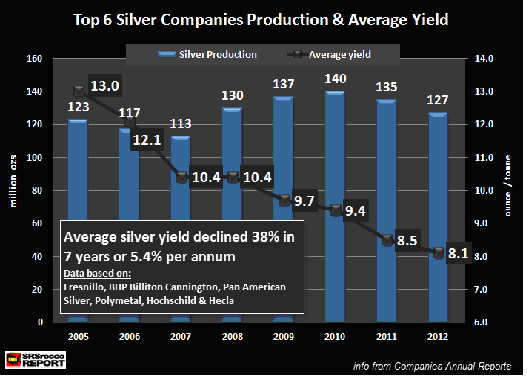 Note that silver mining supplies are down. The world production is 25,000 tons a year and falling. The Indians and Chinese are buying it all up, along with the Big Banks. Every day there is more investment and industrial demand for silver, but less supply. 3/4 of Americans don't want a war with Syria. The idea that Assad is using Sarin (a chemical weapon) against his own people is ridiculous! You would have endless proof of victims with blood, saliva, and urine samples. More lies from Obama and the neocons. It would be no business of ours if he used nuclear weapons! Syria is none of our business. The Mideast is none of our business. America is our only business. George Soros now has a quarter billion dollars in gold investments. He is too rich to buy silver, unless he bought entire silver mines (and there are only a handful of actual silver mines in the world.) Silver is bottoming. That is all that's important right now. This bot timing should end in July at the $18 level. Whether you buy silver bullion at $18, $20, or $22 is irrelevant. Who cares? The best time to buy silver is when you have money in your pocket. Your author bought some at $40 two years ago and is just happy to have it. No one foresaw a two year bear market with a 60%+ drop. Look at the Long Haul, the Big Picture. Silver is the best investment on earth, and has been for 20 years. When you think about it, there is simply NOTHING to invest in other than silver and gold. And silver is four times better than gold. The only possible exception is farm land, but how many farmers do you know? What would you do with a farm? There is simply nothing on this earth to put your money into other than silver. Try and think of one other thing, and you can't. You don't have a choice here. 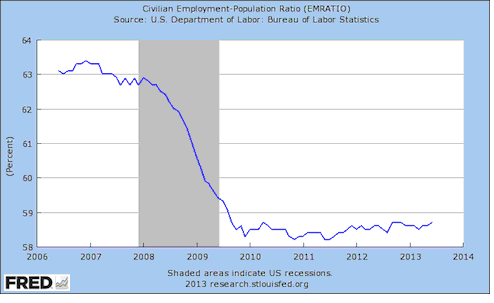 Who is telling you there is a "housing recovery"? Well, the National Association of Home Builders and the National Association of Realtors. That's who. There is no housing recovery. Yes, fools are building houses; that will only make things worse. Housing prices are falling, despite the propaganda. Housing sales are in the toilet, de-spite the propaganda. You will see the average American home for $100,000. Forget all this mania about Edward Snowden the whistle blower. Everything he said was already well known. He didn't expose anything that wasn't already common knowledge. Yes, our government is mad at him for getting more light on the subject of spying on our own people. More media circus to get your attention off the real issues. There are more than one trillion dollars in outstanding student loans now. To put that in perspective the entire GNP is only $12 trillion. The interest just doubled to over 6%. Wonder why we're broke? There should be ZERO student loans. It is not the business of government to send people to school at taxpayers expense. This allows worthless scum-bags to get free money, go to college for one year, take basket weaving courses, and then flunk out. There are countless people now in their 40s, 50s, and even 60s who cannot pay their student loans off- and never will! All debts get paid every time either by the buyer or the seller. That means YOU will pay off the student loans. This makes debt slaves out of millions of people. That is exactly what the government wants- slaves. What is the real national debt? Well, the entire GNP is only about $12 trillion. The media tells you it is about "$17 trillion". That could be paid over time with enough austerity and free markets. The real unfunded liability national debt is about $200 trillion dollars. That can only be paid off by the worst depression the world has ever seen. Remember all debts get paid every time either by the buyer or the seller. There is no such thing as an "unpaid debt". $200 trillion cannot be paid off by the government no matter what they do. If every American gave 100% of their earnings to the government for 50 years it couldn't be paid off. The Much Greater Depression started decades ago. The Canadian Mint just formally approved a plan to produce QUARTER OUNCE silver coins marked "$100". That's right. Do they expect $400 an ounce silver? Obviously they do. Meanwhile Ft. Knox is empty, and no audit has been done since 1946. 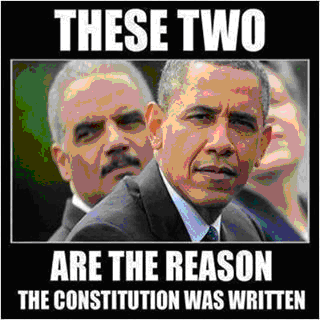 Federal law require a REAL, formal, independent audit every 10 years. There is no gold there. Germany demanded their measly 300 tons of gold back last year, and were told to, "wait seven years". Hitler must be rolling over in his grave! There is no 8,400 tons of gold in Ft. Knox, Denver, the Federal Reserve (NY) and West Point. Those are the four gold repositories. If this was admitted to, or exposed, America would collapse in an hour. If you have any doubts about this at all just Google "gold in Ft. Knox is gone", and you'll get endless proof it was gone decades ago. Want to know how stupid the American sheeple really are? This country is about to collapse totally yet the Consumer Confidence Index is up to 81.4. This is the highest it's been since January 2008, over five years ago. That's how stupid they are. It should be zero. net short silver contracts. On Friday the 28th gold was reduced to only 35,,000 and silver to 4,000. This is huge. J.P. Morgan is actually long now. They were the leader of the Evil Cabal that has been manipulating metals prices for almost 20 years now. Remember that all manipulations end, and end badly. All manipulation is temporary by it's very nature. Reality always wins in the end. The only reservation is the very high open interest of 138,000 contracts in silver. This does not bode well and must come down. Silver may well have bottomed at $18.24. Go to this website. The government now has megapixel cameras that can take a photo of 10,000 people, and then hone in on one face with ONE photo. You have to see this to believe it. You'll be shocked. Use the arrows to move around the crowd. This is the proof they have these spy cameras for us. Your tax dollar pays for these. You are not going to believe this until you see it for yourself. Just cut and paste it. Forget all this ridiculous talk about "tapering". Media disinformation. Bernanke announced QE to Infinity, and he meant it. They will keep printing green toilet paper at the Fed until this country has a complete and total collapse. Severe hyperinflation is your future. Remember the Fed destroyed 97% of the value of your dollar in the 100 years it has existed. The biggest financial fraud in the history of the world. 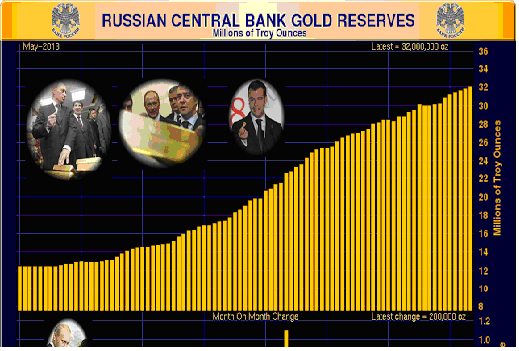 Look at this seven year chart L(2006 to 2013) of how much gold Russia owns. The same is true for China, Iran and other smart countries. Our gold is all gone. ONLY 1% OF THE SHEEPLE ARE PREPARING FOR THE FUTURE. no checks, no ATM, no debit, and no credit cards. Be the 1% who has food, cash, silver junk coins (or 1 oz rounds), guns, ammo. and every other thing you use every day. Common sense tells you to be prepared with six months of everything you need. If you live in the city then move! Be prepared- it has been the Boy Scout motto for over 100 years for a very good reason. Wal-Mart is THE leading economic indicator stock by far. 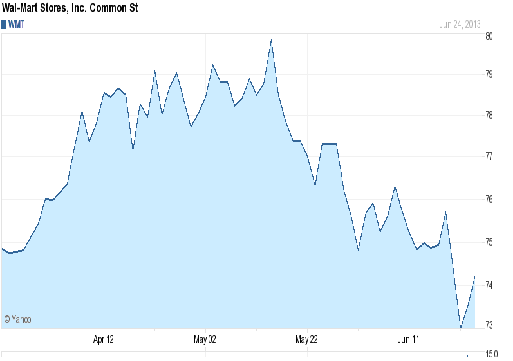 Look at this three month chart of WMT stock. It is collapsing at more than 30% a year at this rate. If Wal-Mart can't make it, then no one can make it. The biggest retailer in the entire world. There are 441 trillion dollars in known derivatives currently. The entire GNP of the U.S. is only $12 trillion. This is more money than the entire GNP of every country on earth. These are imploding as you read this. We have never had derivatives in history; this is the first time. We cannot even accurately define them. When they implode the entire world economy is going to implode with them. Remember all bills get paid all the time. You are going to pay for the derivatives insanity of the bankers. They certainly aren't. You've heard the new term "bail ins"? That means the depositors like you pay the bill when the banks go broke. The Perth Mint is Australia's largest metals dealer by far. They cannot fill orders going back to April. Gainesville Coin is one of the largest coin dealers in America. They are out of stock. Apmex, Tulving, and Kitco are all very low on silver stocks. Soon, you will see big premiums on silver and only back orders. Then silver bullion will disappear for the investor. Only the industrial users will get any- and they won't get what they need. We are almost totally and completely out of silver, and mining can't possibly even begin to supply what we need. This is the first time in history we've run out of silver. Put your entire net worth into silver bullion you hold personally. No paper silver and no storage programs of any kind. You must hold it yourself no matter what you need to do. 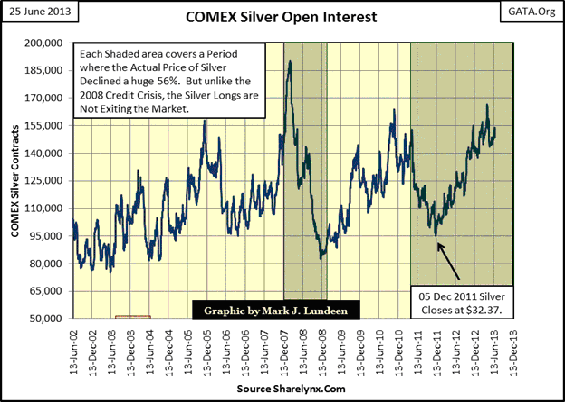 Below is the silver open interest chart. It has fallen to 138,000, but the price will not take off until this high open interest falls to well under 100,000. That needs to happen. Glenn Beck is normally never quoted, but this three minute video is excellent. He shows the leader of the terrorist Syrian rebels cutting the heart and liver out of a Syrian soldier with his knife, and eating them. We are arming these terrorists, even though 3/4 of Americans want nothing to do with waging war on Syria. Watch this three minute video. Even extreme liberal Jewish Zionist Bill Maher said, "we are basically arming Al Queda in Syria". There is another video too sickening to send out to you. This one is sickening enough. The rebel terrorists beheaded an Orthodox Christian bishop and his fellow priest with army knives. Obama is arming these subhumans while taking our guns. Watch this video! Three fourths of Americans are living paycheck to paycheck. One fourth has less than $100 in total savings. Another half has less than $800 in total savings. The last fourth isn't hitting on much for the most part. 90% of Americans now only make $31,000 or less. That's $15.50 an hour. Only 7% are self employed and that is falling. Soon America will be another third world impotent backwater instead of the World Bully. You know, like Britain. Britain "ruled the waves" 100 years ago and was the World Superpower, not the U.S. Now it is a third world backwater of no real significance. The Much Greater Depression started decades ago and will finally manifest very soon. We'll be another insignificant third world backwater too. THE INCOME TO DEBT RATIO IS NOW AN INSANE 154%. In 1989 the debt to income ratio was a reasonable 58%. That means people were living within their means and actually saving money. Today the debt to income ratio is an insane 154%. This means people are living over their heads and are deeply in debt. This cannot and will not go on. The laws of economics says it can only end in a total and complete disaster.